Here in Florida, we often catch Little Tunny (nicknamed “bonita”) when trolling for other species such as dolphin, wahoo and sailfish. A lot of guys cuss out the bonita for their vicious attacks on the trolling spread, but I welcome them into the cooler. Having a few bonita on hand is a great insurance policy. These small tunas make excellent baits for a range of species from marlin to grouper, but it’s the bellies that really come in handy when trolling and jigging. Bonita bellies are very durable and naturally shiny. 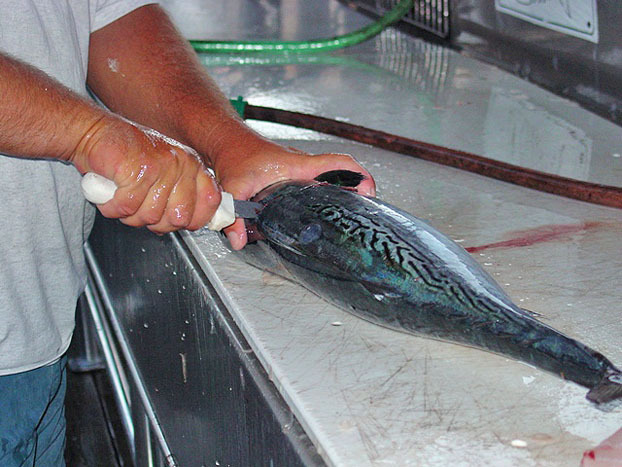 When cut into strip baits, they make an awesome trolling bait that will catch everything in the ocean. 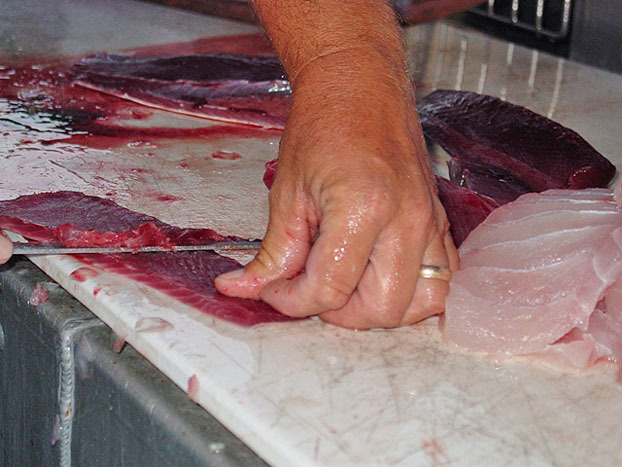 The reason a lot of people don’t fool with them is that there is definitely some prep work that has to be done at the end of a long day and after the other fish have been cleaned. But the effort is well worth it. 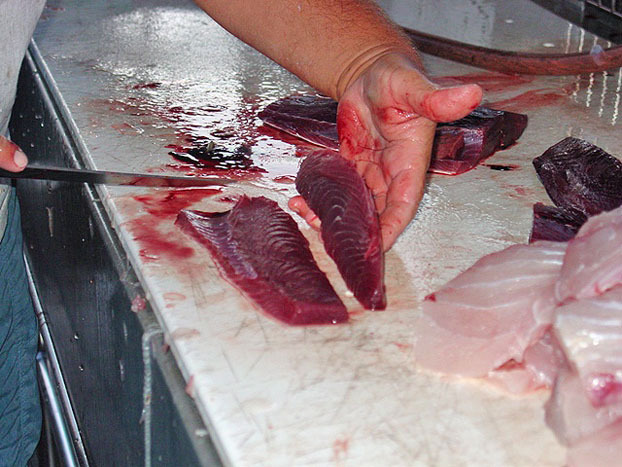 To make your own strip baits, you will need a sharp knife, not the one you just cleaned all of your fish. From there it’s a rather simple process, which is outlined below. 1. First, cut down behind the gills until you get to the spine. 2. 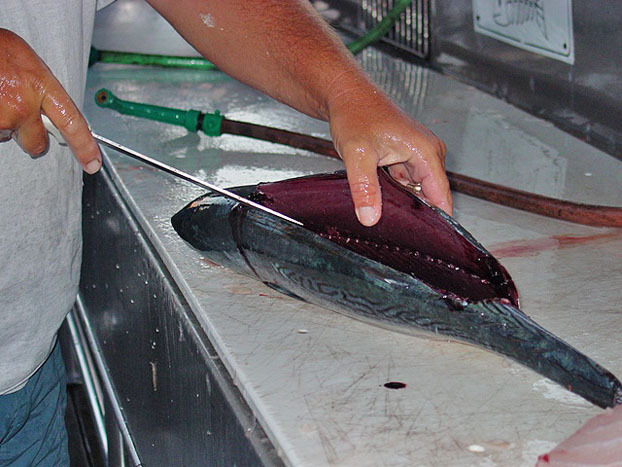 Then fillet towards the tail, cutting just above the backbone. 3. 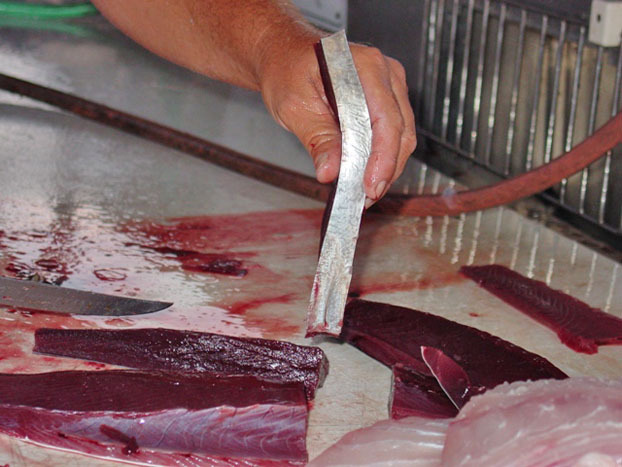 Take the fillet off of each side at its full thickness. 4. 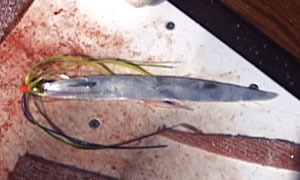 There is a row of bones down the center line of the fillet. Cut this out leaving the top and bottom of the fillet, which are boneless but thick with meat. I prefer the lower belly portion of the fillet for trolling strips. The skin is shiny and the grain of the meat is tighter and lasts longer. The upper portion or back can be used for trolling, but the grain of the meat is bigger. I save the top half for bottom fishing bait. 5. Using a sharp knife, start to trim down the meat. Don’t try to cut down the full thickness on the first cut. You want to end up at with a thickness that is about a quarter of an inch, but if you try to cut off too much at once it is harder to keep the blade level. It’s better to do a little bit at a time. And be careful. If you cut too low or nick the skin, you will ruin that portion of the strip. 6. 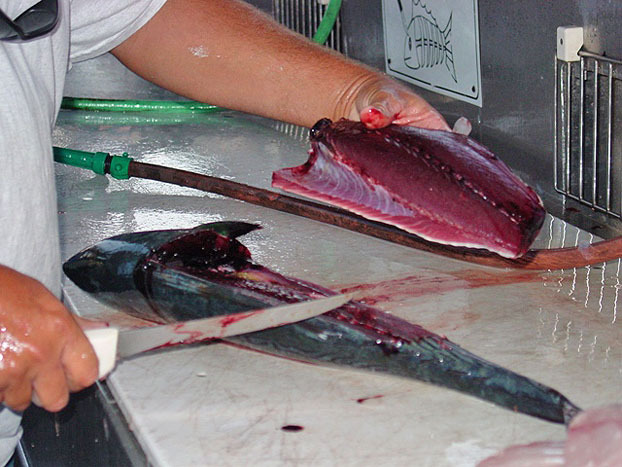 Remove the first layer, which can be saved for chum. 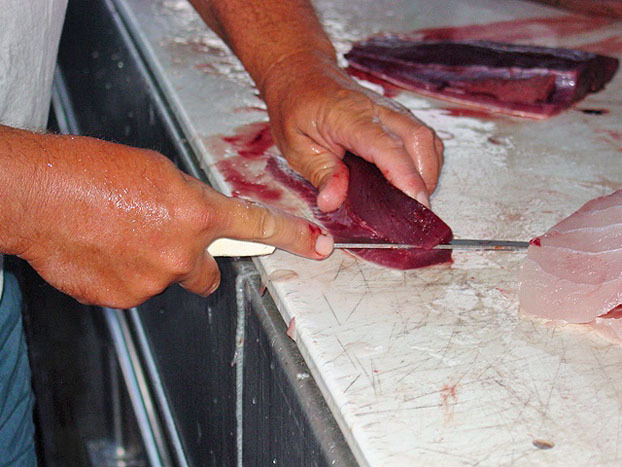 The meat can be easily nibbled off of a hook if it is without any skin, so it’s not a great bait. But you can still use this skinless meat to chum up fish. 7. Keep shaving off a small layer at a time until you reach about a quarter inch or less of meat left on the skin. 8. This is the final thickness. 9. Now salt the meat side of the fillet lightly, but evenly using non-iodized salt. 10. If you want to freeze the strips, put the meat sides together. 11. Don’t bag all of your strips in one bag. Break them up into portions. Try not to get the salt in the bag’s zipper as it will not seal. 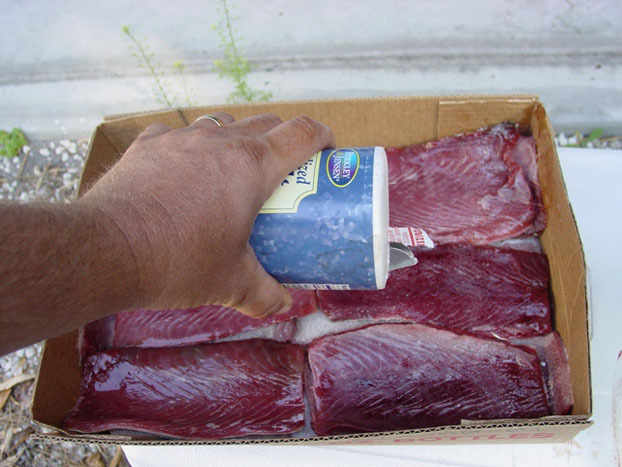 Squeeze the air out and freeze for your next fishing trip. 12. Cutting the strips requires a sharp knife as well. The grain of the meat (especially on the upper portion of the fish) is like a row of shingles on a roof. 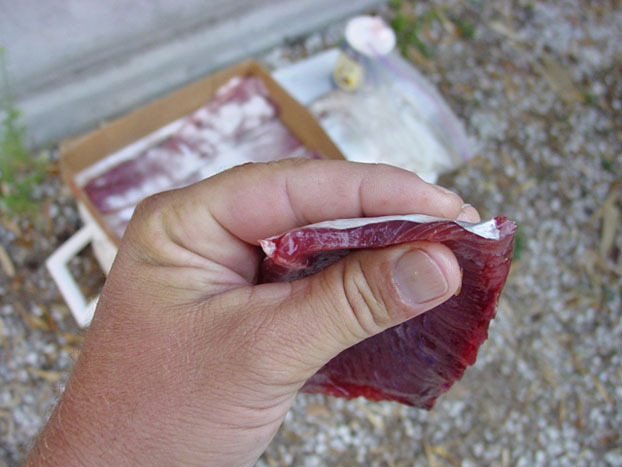 You want to use the tail end of the fillet as the front of your strip bait. This is the desired shape, using the slightly squared end for the front of the strip. Don’t get too square. We typically fish our belly baits with a Sea Witch or lure head, and that helps to streamline the front of the bait so it swims well and puts out a lot of shine and color. 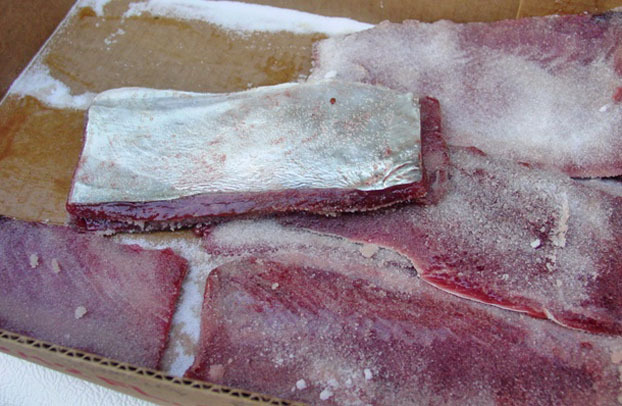 Believe me, stocking up a freezer full of strip baits is well worth the time and effort. 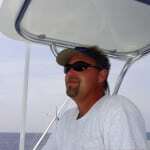 Get lots more fishing and rigging tips from Capt. Scott Goodwin on BD.